In that article I will show you some basics of CoreData framework, which is a tool for iOS, macOS, tvOS and watchOS platforms to manage objects modeling, lifecycle and persistence. But I’ll not try to summarise or cover every point from the documentation. You can do it yourself here — https://developer.apple.com/documentation/coredata . Instead, I will show you how to model your objects and how to run queries if you want to read or write something. A sample project that we will be creating will be build with Xcode 9 and Swift 4. 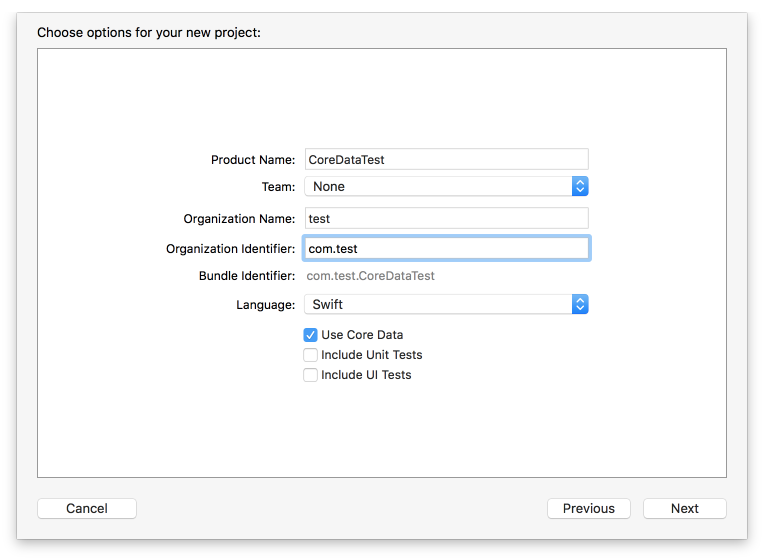 First, let’s create a new project and let’s select “Use Core Data”. Although you can add that framework for your existing project, it’s easier to add it from that place as everything will be wired up already for you. Once the project is created, you will see a file like CoreDataTest.xcdatamodeld added. 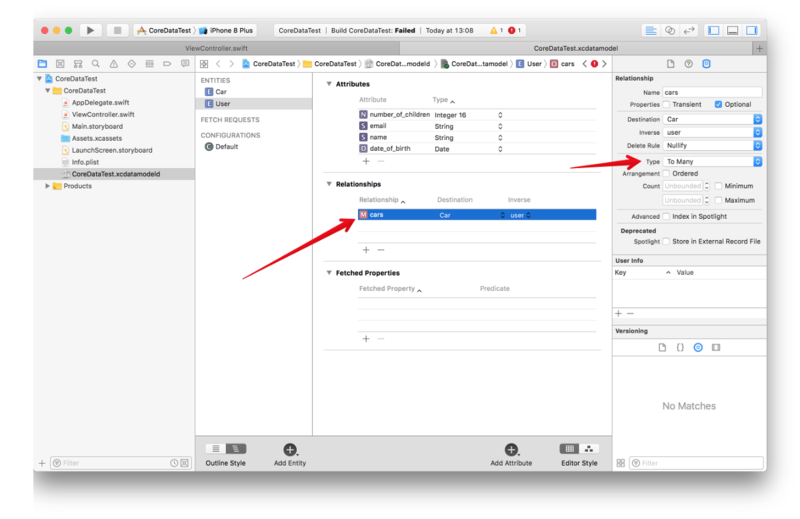 When you click it, you will see a tool that allows you to configure entities which represents data models. You can define few things for each entity there but for us Attributes and Relationships will be most important. Let’s add a new entity called User (to change it’s name once you’ve clicked Add Entity button, click the name of a newly added entity on top twice and type in your name). Same way let’s add a new entity called Car that will include attributes: model — String, year — Integer 16. But now let’s add a relationship between cars and users. 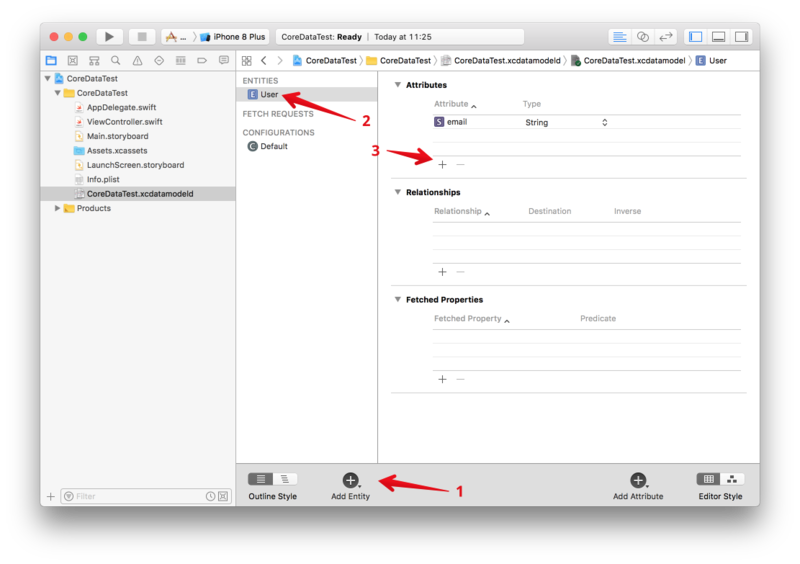 To do it we will add a relationship, represented by user, from that point to User entity. Than you have to get back to User entity and set relationship with Car. After that on Car you can set an inverse relationship to User. Last step in the editor is to configure proper type of relationship. By default it’s “To one” which is one-to-one relation. In our case, a user can have many cars, so let’s change the type for the relationship “cars” on User to “To Many”. OK, so we are done with modeling. Now, let’s see how to create a new object, persist in the storage and read it after that. CoreData uses a SQLite database as the persistent store. 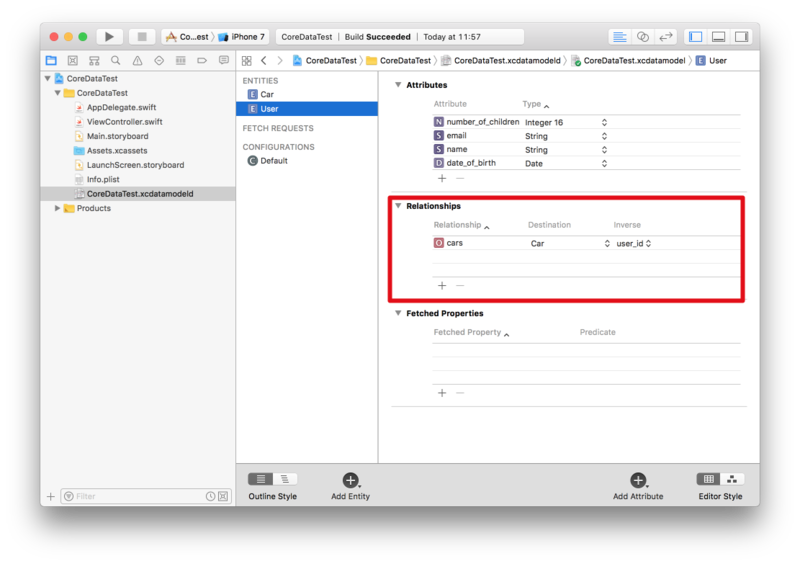 Before we do this you need to create an object called managed object model, which describes the way Core Data represents data on disk. You will use that object to send requests to it so it can hit the database. We’ve created a new object user and we’ve set up values for each of the attribute that we’ve defined before. let carEntity = NSEntityDescription.entity(forEntityName: "Car", in: managedContext)! We’ve created a managed object model for a car (carEntity) and we’ve added BMW X6 and Audi TT. What is important here is that we’ve connected these cars with John using a relationship defined above (car1.setValue(user, forKey: “user”)). We are calling save() on managed context. In terms of any failure, we are printing some useful error information. 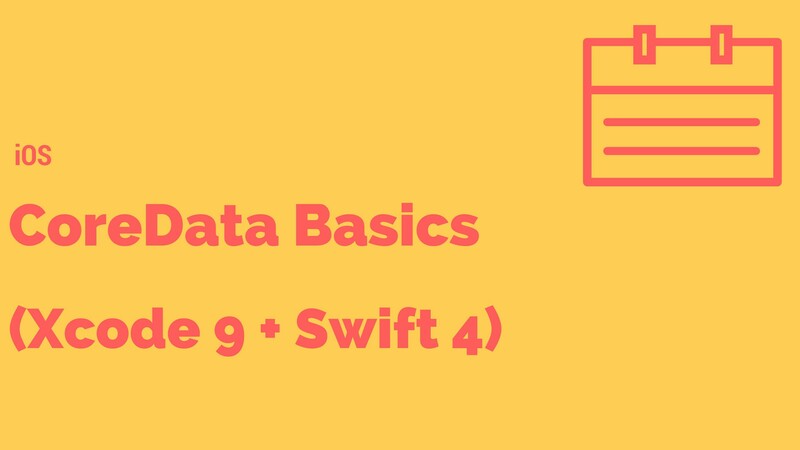 CoreData framework has a lot more, like data migrations or background tasks but for a day to day work, you will rather use the basics I’ve showed you above.